Barcelona have an ongoing concern over Samuel Umtiti, and it’s suggested that they will bring in a short-term solution if he is forced to have surgery. The Frenchman returned from a knee injury against Atletico Madrid last weekend, but was forced to sit out the Champions League with PSV in midweek due to the same problem. Given the Catalan giants have been leaky enough as it is at the back so far this season, conceding 19 goals in just 13 La Liga games which gives them the joint-worst defensive record of the top eight sides in the standings, the last thing they need is to be without Umtiti for a lengthy period of time. Having opted for treatment as opposed to surgery when the initial problem flared up, it remains to be seen if Barcelona reconsider their position in the best interests of the centre-half, but Mundo Deportivo claim that they have a strategy in mind if he does need a procedure. 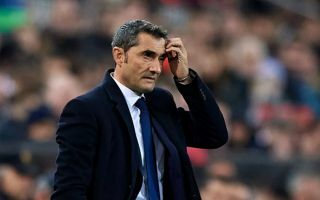 It’s suggested that Barcelona will target a short-term veteran option to add quality and depth to their backline for the second half of the season if Umtiti is sidelined, with Branislav Ivanovic named specifically as a potential solution. Meanwhile, it’s added that Matthijs de Ligt remains the long-term goal, but with only Gerard Pique and Clement Lenglet available as reliable options in the heart of the defence without Umtiti, more immediate action will surely need to be taken. It seems like a sensible strategy from the Catalan giants, as they are dangerously light in that department without Umtiti, and for a club looking to compete on multiple fronts this season, if he is sidelined for a significant period of time then a more immediate replacement will be needed to fill the void this season.